Zeugnisse and Werkzeuge cannot be reduced simply to numbers. However, a visual display of quantitative information regarding the who, what, where, and how many regarding Zeugnisse and Werkzeuge can help us see patterns and trends regarding ebbs and flows in Inspirationist activity. Nearly 4,000 testimonies were delivered by 17 Werkzeuge during the 35 years from the founding of the Wahren Inspirirten until the death of J.F. Rock. The graph below correlates the number of testimonies (quantity) that were delivered in a year (time) with the Werkzeuge who were active in those years (duration). For example, in 1716 there were 881 testimonies delivered by Werkzeuge Wagner, Gruber, Rock, Mackinet, Mayer, and Gleim. 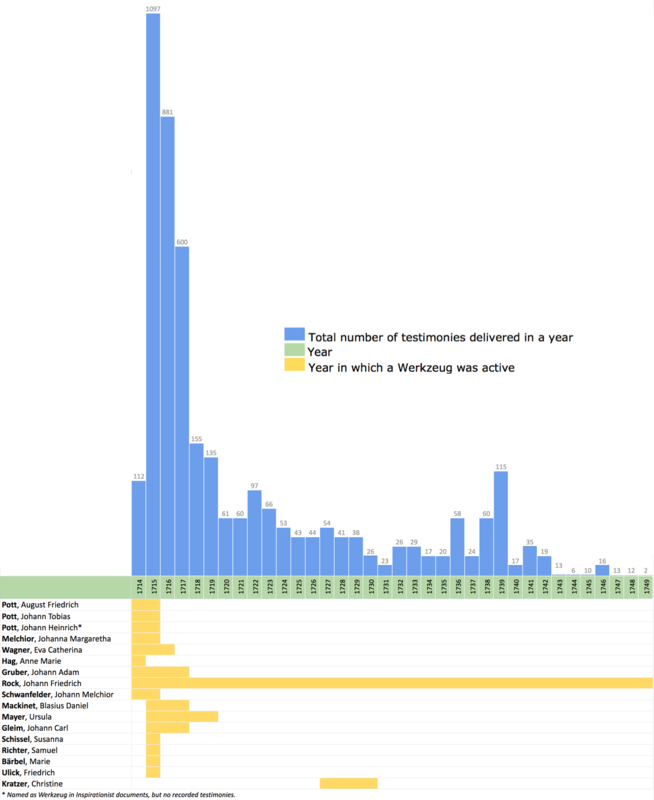 This graph shows the total number of testimonies that each Werkzeug delivered during their period of activity. It is no surprise that J.F. Rock, the longest-serving Werkzeug, also delivered the greatest number of testimonies. 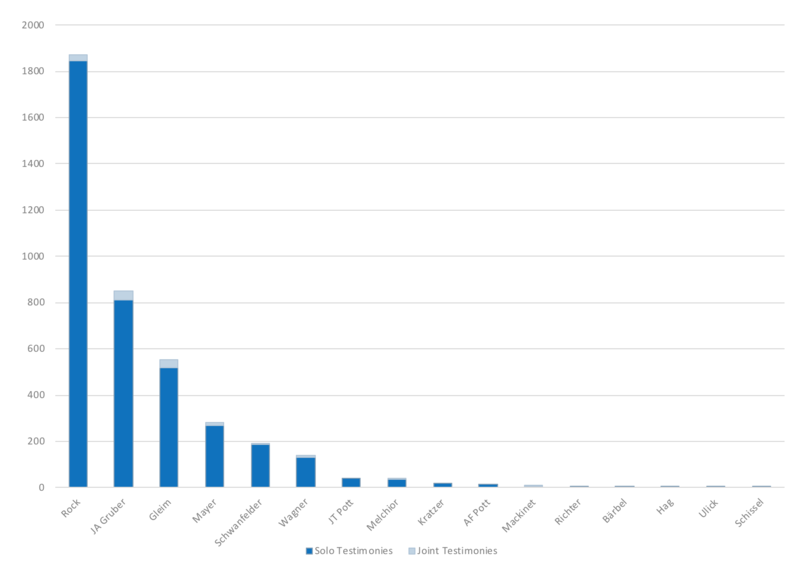 This graph shows the number of testimonies delivered by location (for the top 15 locations). During these years Werkzeuge delivered testimonies in more than 300 locations, primarily in German territories, but also in Alsace (France), Switzerland, and Bohemia (Czech Republic). 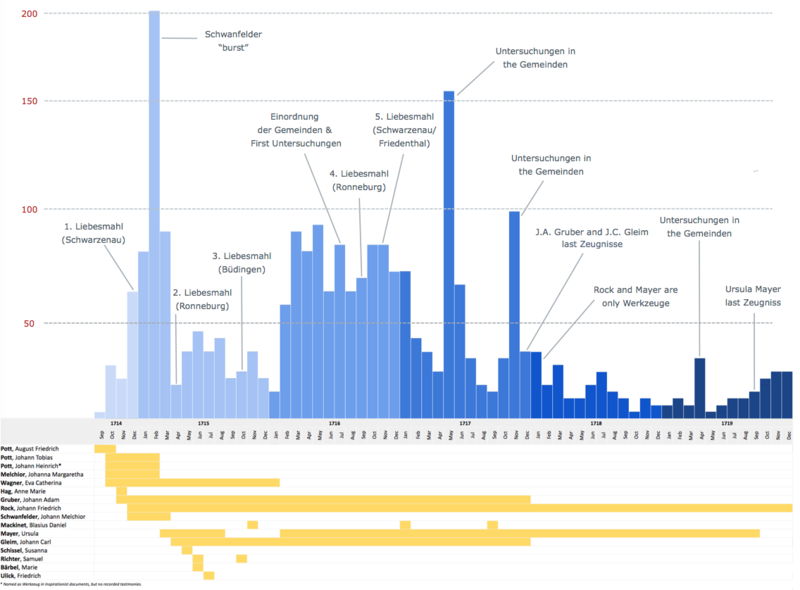 This graph illustrates testimony and Werkzeug data at a more granular level by showing the sum total of testimonies per month during the early years of the Inspirationist Awakening, from September 1714 until December 1719. During these 64 months at least 2,978 testimonies were delivered by 16 Werkzeuge. 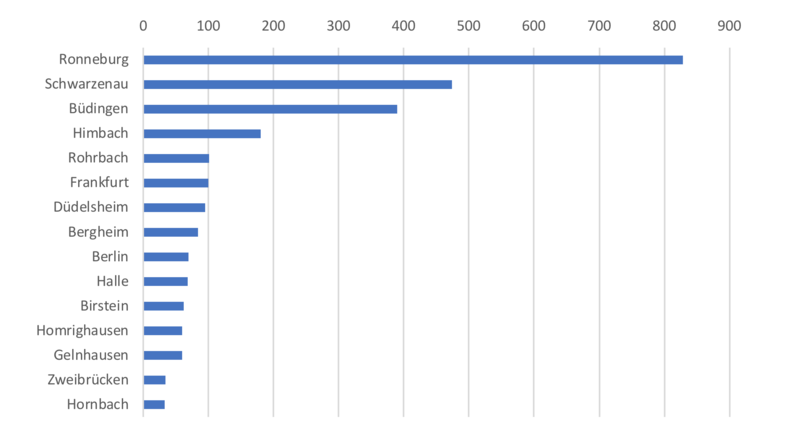 Notable factors contributing to monthly totals include Schwanfelder’s short but intense burst of activity (Schwanfelder delivered 98 of the 201 total testimonies that month); the five Liebesmahls (Love Feasts); the Einordung of the Gemeinden (hierarchical organization, naming of Vorsteher, etc. 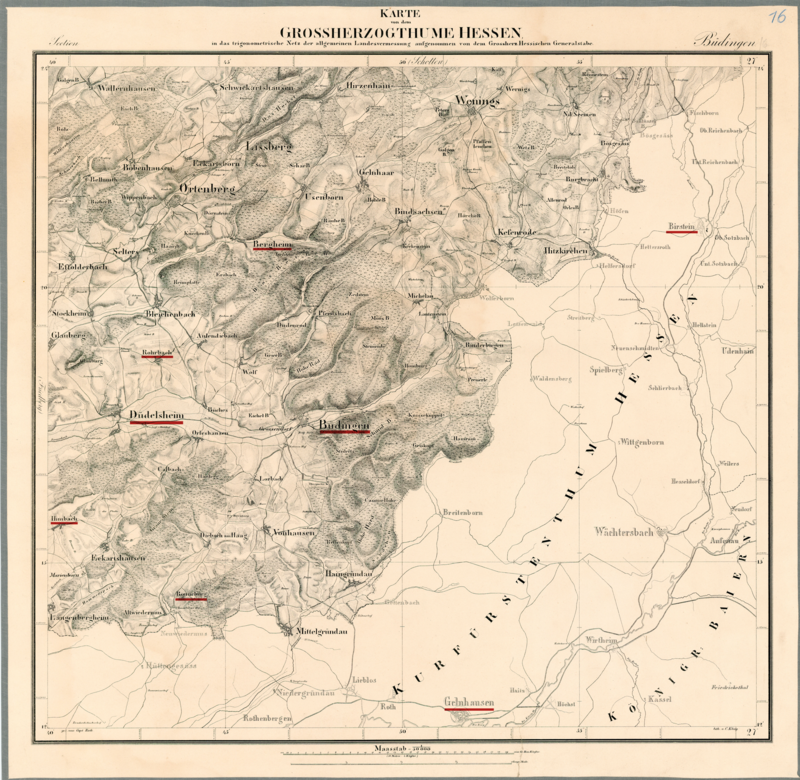 ); the Untersuchungen (spiritual examination of members); the final Zeugnisse of J.A. Gruber and J.C. Gleim, leaving only J.F. Rock and Ursula Mayer as Werkzeuge; and the final Zeugnis (testimony) of Mayer, leaving Rock as the sole Werkzeug.